PLEASE NOTE THAT THIS OUTING IS FOR PAID-UP MEMBERS ONLY!! DATE &TIME: 09:45 for 10:00 on Saturday 26th November 2016. 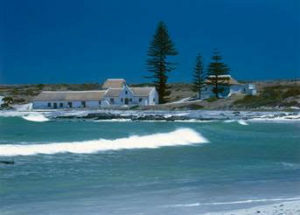 Our outing this month is to Buck Bay (Bokbaai), where John Duckitt will lead us on a tour of this historic farm which belonged to the Duckitt family for many years. Directions: take the Ganzekraal turnoff from the R27 (it’s the next road to the left after the road to Silwerstroomstrand) then immediately on your left is a dirt road marked by a CapeNature sign, as well as two smaller signs for Lucas Thatchers and AYE Building. This is where we will convene, to form a convoy which will then drive in single file down the one-lane road to Bokbaai. At 10.10 (latest), we will follow this road, which is in fairly good condition (OK for a normal sedan car), until we reach a gate with another CapeNature sign (as well as a host of others). The owners will arrange for the padlock on the gate to be unlocked, so we all go through the gate and continue on for about 5km until reaching the farmhouse, which will take about 20 minutes. 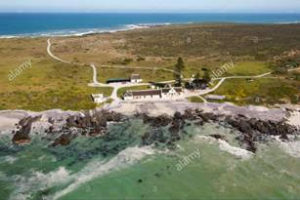 When we are down at Bokbaai, please park “at the back” (away from the sea homestead and outbuildings) so that we can enjoy the surrounds without cars littering the views. It would be appreciated if members can share lifts so that there are as few cars as possible. Our hosts for the day are the Mapula Trust and the Parker family, the current owners, and John Duckitt, whose family owned the property for many decades, including in his childhood years. John Duckitt will be showing us around, and prefers a question and answer type session, so please come with your questions lined up. The land was originally granted in quitrent to Laurens Johannes and Jacobus Petrus de Jongh; with the accompanying survey dated 1827. 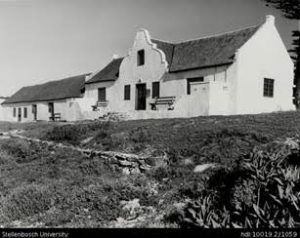 However, according to Hans Fransen, its history goes back to the early days of the VOC when the house possibly served as the home of the supervisor of the lime kiln that operated from here from the early 18th century together with accommodation for labourers. This long T-shaped house with a simple holbol gable and an attached outbuilding lies close to the sea. We are invited to picnic (there is some shade, hats and /or umbrellas probably a good idea) and to swim in what is apparently a very pleasant bay. So swimming is encouraged by the Parker family! PLEASE REMEMBER TO WEAR YOUR BADGE (WITH THE CORRECT COLOUR INSERT) TO THE BOKBAAI OUTING!